San Francisco, CA, May 14th, 2018 — Episcopal Community Services (ECS) of San Francisco, a leader in San Francisco’s plan to create more supportive housing for individuals and families experiencing homelessness, is proud to announce its 14th annual CHEFS Gala fundraiser on June 7, 2018 from 6:30 p.m. – 10:00 p.m. at Bespoke, located at 845 Market Street atop Westfield Centre. Guests at the event will enjoy tastings and cocktails from 22 of the City’s best restaurants while participating in live and silent auctions. The fundraiser aims to raise awareness about San Franciscans experiencing homelessness and provide funds for housing, services and job training for the 7,000 people who access ECS’s services annually. A year after its most successful event yet, the 14th Annual CHEFS Gala looks to build on its momentum by creating even more opportunities for the very low income men, women and children whom ECS serves annually. Tickets are now on sale and can be purchased at chefsgalasf.org. 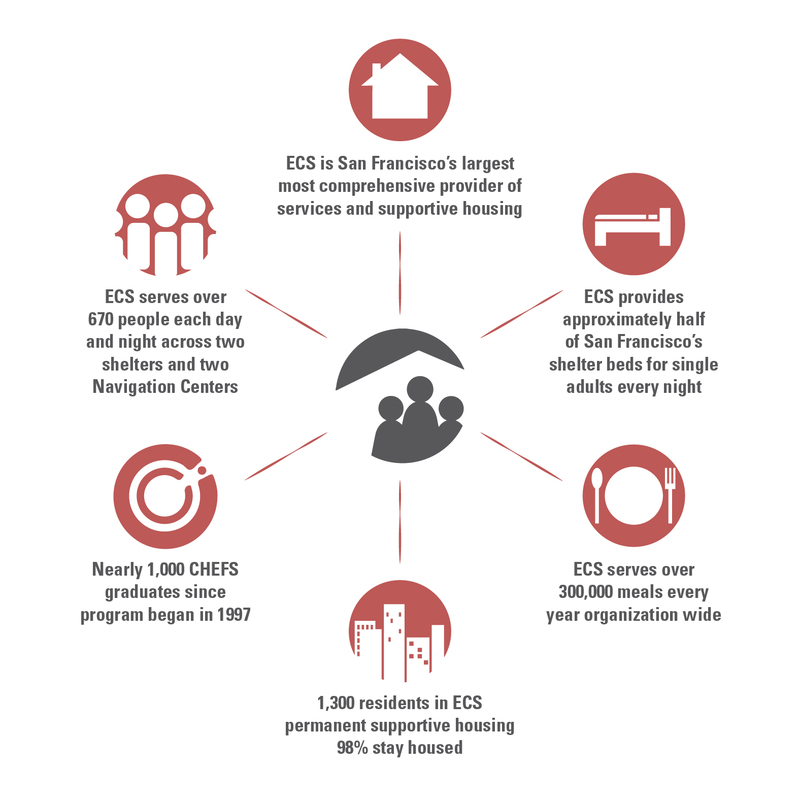 As San Francisco’s fastest-growing provider of supportive housing, ECS is committed to finding solutions to end homelessness by helping individuals and families gain the tools necessary to exit homelessness, from shelter to housing to employment services. The organization provides approximately half of San Francisco’s shelter beds for single adults and 96% of the formerly homeless residents who access ECS housing remain permanently housed. Starting July 1, ECS is implementing a, first of its kind in San Francisco, coordinated access system of care. For more than 35 years, ECS has pushed boundaries through innovative programs such as the City’s first Navigation Center, which offers intensive case management, temporary shelter, and services to help homeless people find permanent housing. Most recently, the city of San Francisco selected ECS, in conjunction with Mercy Housing, to build and operate San Francisco’s largest permanent supportive housing development for formerly homeless people near Mission and 7th Streets. The two-building development will provide permanent homes for up to 265 households experiencing chronic homelessness, with 100 new units allocated to formerly homeless seniors, age 62 or older. as well. Guests will enjoy cocktails provided by Tonic Beverage Catering, as well as tastings from Magnolia Brewing Company, Scribe Winery, and Chimney Rock. CHEFS Gala seeks to raise awareness and $400,000 to support ECS’s vital programs, including the marquee CHEFS program. This five-month culinary training program provides people impacted by homelessness and poverty with technical and professional skills through classroom instruction, hands-on kitchen training, and a local food service internship. Lead sponsors include staunch ECS supporters Cahill Contractors LLC, Heffernan Insurance Brokers, Herman Coliver Locus Architecture, MUFGU Union Bank Foundation, Hood & Strong, Keller & Benvenutti LLP, Silicon Valley Bank, Good Job Brothers, Market Design Furniture, Inc., and Xantrion. Leslie Sbrocco, host of the PBS restaurant review series Check Please! will emcee. Episcopal Community Services of San Francisco (ECS) has provided essential services to homeless and very low-income San Franciscans since 1982, utilizing a holistic approach that addresses the multiple causes leading to homelessness. The agency serves more than 7,000 people a year – through emergency shelters, Navigation Centers, 12 permanent supportive housing sites, adult education, workforce development, and a senior day center — guided by a mission to help homeless and very low-income people obtain the housing, shelter, and services each person needs to prevent and end homelessness. For more information about ECS, visit ecs-sf.org. Photography: Download photographs from CHEFS Gala 2017 as well as photography of ECD programs.